A journey home last year was one of continuous rain and the vacuum window wiper refusing to work, in fact I had to operate it by hand for over a 100 miles, and then it started working just in time to cover the last 800 yards home! Following that most unpleasant journey, I decided to modernise and fit an electric motor. The Club’s Tat Merchants had one they could not shift at Beaulieu, so we came to an amicable fee and I ‘restored’ the old motor, a DW3 which is the last type fitted to Austin Sevens. My first venture into the rain was not good, the motor worked, but the swept angle was only 90° - Photo 1, and I could not see much to either side of the car, bearing in mind I sit rather high in the car. I did temporally alter the gear inside to give a better view on the offside, but found I could then see nothing to the nearside. 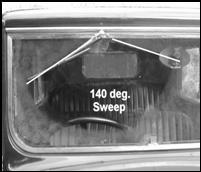 I thought this was a retrograde step, the vacuum wiper had given a swept angle of at least 130°. I stripped down the DW3 and reasoned that If I moved the pivot point further from the centre of the ‘Gear’ wheel I should be able to get more travel to the connecting arm and thus increase the swept angle of the wiper arm. 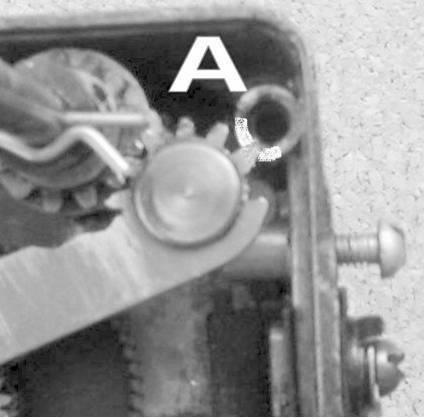 I did experiment with a number of holes - Photo 2 - in a spare gear wheel and settled on an increase of 1.7 mm from the centre of the gear wheel to the new pivot point (‘A’ is original, ‘B’ is the final hole, ‘C’ and ‘D’ are experimental holes). 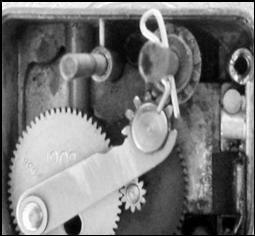 However this then meant the gear teeth on the end of the pivot arm hit the tube moulding ‘A’ - Photo 3. I removed this area low enough to clear the teeth. 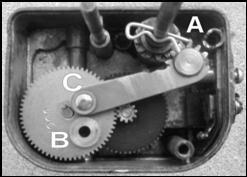 The original position reached by the pivot arm is shown in Photo 4, ‘B’ is the new bearing hole, ‘C’ is the original. 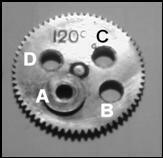 The revised arrangement gave a swept angle of just under 170° as shown by the positions of the ‘R’ pin in Photo’s 6 and 7. 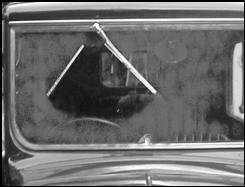 However once this is transferred to the wiper blade and the mechanical losses are taken up there is about 135° of swept angle on the windscreen - Photo 5. Just as an aside the DW3 gear wheel is marked 120° and indeed it does sweep about 120° in the motor, it’s the mechanical losses that end up as 90° on the windscreen. I understand the ‘Pull and Spin’ electric motors have a swept angle of around 110 degrees. This article, written by Sandy Croall, originally appeared in CA7C Seven Focus in Mar 2006 pp 13-15.